The flag of Funchal is a 2:3 purple over yellow gyronny (city rank), the coat of arms centred over all. It is a typical Portuguese municipal flag, with the coat of arms centred on yellow and purple gyronny background. Shield Vert five sugar loaves Or spirally garnished and coasted Purpure set in cross, the whole cornered by four grape bunches Or, each bearing an inescutcheon charged with five plates (“quina”) set in saltire. Mural crown Argent with five visible towers (city rank). White scroll below the shield with upper case black capitals 1) "CIDADE DO FUNCHAL" (left flag image above), or 2) with honorific scroll meaning «The noble and loyal city of Funchal»). The cumbersome long text seems to have been set upon the scroll in two ways: In one line of text, set in a compact, slender face, as shown at this photo with inscription "A NOBRE E LEAL CIDADE DO FUNCHAL" (central flag image above) or within source, p.72 with inscription "A NOBRE E LEAL" in a much smaller fontsize, centred above the official 1936 text "CIDADE DO FUNCHAL" (lower, bigger line) (right flag image above), perhaps a token of "defaced" imagery, not newly produced, at least at first, shown here, and in many other sources. The latter is quite representative of Portuguese municipal and submunicipal flags, it’s only uniqueness is the two lines of text in the scroll. The flag of Funchal is exactly as shown, but not really frequent in the city. The atypical scroll set in two lines, which is locally used, according to many sources (incl. my eyes, in my visits there in June 1995), is not prescribed by law (publ. Diário do Governo, I Série on March 24th, 1936), and the grapes are usually shown purple (Proper), not golden as the law prescribes. In 2012 the scroll displayed simply "CIDADE DO FUNCHAL". This variant (left flag image) - and only this - was spotted in February 2012 in various places of the city, e.g. near the cathedral, on Autonomy Square, in front of the theatre, in front of the court, and in front of the local branch of Banco de Portugal. Still according to source, the flag was first hoisted at the City Hall on 28 May 1936, for the 10th anniversary of the so-called National Revolution: Indeed back then in 1936, freshly at the start of the dictatorial 2nd Portuguese Republic - the so-called New State (Estado Novo) - the text of the scroll was decided by the SHAAP (also freshly new itself) to be of the plain usual type, and not "A NOBRE E LEAL CIDADE DO FUNCHAL" ("the noble and loyal city of Funchal (=Fennelfield)"), the honorific, that had been used in the arms of the city since at least 1757 (and possibly much earlier), notably on the flag 1919 - 1936 that the new law was replacing. In all known previous Funchal arms either there is no scroll, or it reads simply "Funchal", or this honorific title is used (with varying spellings); its use is also attested in other emblematic media (source gives an interesting and exhaustive overview), and was very much alive at the time of the adoption of the new arms and flag. This refusal to include the honorific is interesting, as the SHAAP was fully aware of its presence in the history of the Funchal arms, having been supplied with documentation by the municipal government - indeed the Dec.1935 final assessment was the last step of a five-year long process, in parallel with all other local government bodies that reacted to the CHAAP's "call to arms" of April 1930. It was an exceptional measure, as some of the arms newly created or "confirmed" by the SHAAP around this time do include similar special scroll texts - notably, also in 1936, the extra-unusual double scroll arms of Campo Maior: Whatever the reason, it was not a refusal against exceptional scrolls, it was a refusal against Funchal. Within source pp.46-48, it is hypothesised that the national government might have vetoed any kind of deferring treatment of Madeira, due to the local political sentiment against the regime at the time, causing the traditional honorific to be dropped in this case while upheld elsewhere. In 1986, already in a democratic regime and after Madeira had become an Autonomous Region, the municipal government of Funchal decided to change concordantly the text of the scroll to include the full title "A NOBRE E LEAL CIDADE DO FUNCHAL" - this was decided in meeting of the municipal government on 31 July 1986 and approved by the municipal parliament on 3 October 1986 - the text of the decision deplores the "colonialist stance" of the 1936 law and seeks to mend that "retaliatory and debasing act against this population". This decision was never revoked, but the legal frame of the Portuguese legislation about local symbols (both the 1991 law and the 1930 dispatch it replaced) gives no authority to local government bodies to overrule CHAAP's decisions. In practice, the flag was locally changed by its own flag-bearing entity, though, and flags showing the honorific scroll are vexillological facts. The legal prescription of this flag is yellow and purple gyronny, usually worded in Portuguese as "gironado de amarelo e púrpura", although it was officially described in the official law text, transcribed from the SHAAP's assessment of 1936 (fac-simile of the hand written original on p.103 of book Abreu & Gaspar, as "quarteada de quatro peças de amarelo e quatro de pú�rpura" - litterally "quartered of four yellow parts and four purple parts", which litterally doesn't add up; a few years later SHAAP/CHAAP's wording had become more accurate, although some heraldic bad practices got stuck since the begining till today. Another variation in the representation of the arms on the flag, that is neither present in the 1991 law nor in the 1930 dispatch, but was a "non-written rule" (among a few others) often repeated, is that, if the scroll contains only the name of the municipality and not a special motto, it can be omitted - leading to the municipal flag of Funchal used in 1936 having only the shield and its crown, but no scroll, as can be seen in the meeting hall of the municipal parliament in the City Hall of Funchal. It is likely that the use of this exact design was soon or immediately replaced or at least accompanied by the more usual style, which includes always the scroll, regardless of its text. Flag and arms approved by the municipal government (as there were no municipal parliaments back then) on 6 February 1936, after the SHAAP's (back then named "Secção", ãsectionã, and not yet ãComissãoã, ãcommitteeã) assessment of 20 December 1935, and promulgated by the national government's Ministerial Edict (Portaria_) no. 839, of 24 March 1936, published in the official journal Diário da República: I Série on the same day. This law introduced, as said, a new flag design, created according to the then brand new regulations for Portuguese municipal flags: Gyronny pattern, denoting city rank for the namesake settlement and seat of the municipality (Funchal was founded in 1424, upgraded to town status in 1452, and upgraded to city status in 1508, so no issues here), using a metal and a colour taken from the arms (Or and Purpure - and more about them later), charged in the centre with the arms itself. However some times this gets reversed, and the change may go unnoticed and spread as flag makers and other users of the flag's image copy each other. 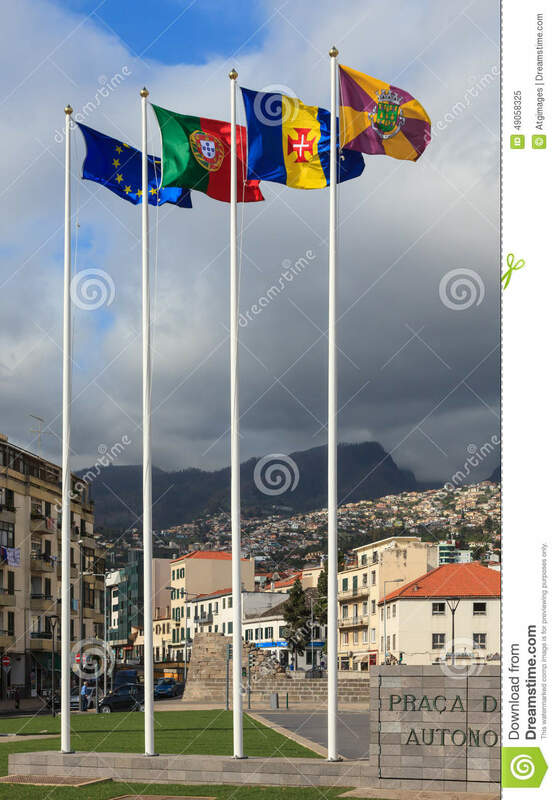 This has happened in Funchal and it is easy to find examples, showing that incorrect use in an official setting, a four-flag display in Praça da Autonomia, mantained by the municipal government. (This accidental swapping may happen to any gyronny flag, and it is documented to be pervasive, and crystallized, in some cases. In parallel the legal text may prescribe colourand metal instead of metal and colour, and that might get later accidentally swapped, too. There are several written references to municipal flag use in parallel with the arms, but no depictions nor detailed descriptions prior to the 19th century. Indeed the pre-1936 version of the arms had ever consisted of the five silver sugarloaves set in cross on a green shield. Changing them to golden and adding the purple ornamentations was another gratuitous modification introduced by the SHAAP - against its own stated goal of researching and restoring the most authentic historical arms, undoing later-day defacements. The earlier attestation of these arms is of 1574 (see p. 24 and foll. of [u2f07]) and it might have been earlier. Even allowing for accuracy of all other versions (three loaves in pale or in counter-chevron, etc. ), the basic design of five sugar loaves set in cross had been a constant for well over 300 years prior to 1936, and copious attestation of that was given by the Funchal municipal government to the SHAAP during the adoption process. The sugar loaves on the arms, of course, refer to the importance of sugar cane farming and processing, which started soon after the initial settlement of Madeira in the 1420s. There has been some debate concerning the exact item that is depicted, whether it is the sugarloaves themselves, or the pottery molds they are produced in. Additional tokens of sugar industry, sugarcane plants themselves, are often the supporters of the shield, occasionally depicted inside it, palewise. Later on, as the importance of winegrowing supplanted that of sugar, the sinister cane was replaced with a vine plant. The oldest visual representation of a Funchal flag is on the background of a 1817 oil portrait of Maria Leopoldina of Austria, painted by a certain João José do Nascimento: It shows a long white flag with a green, vertically oblong oval, charged with the cross of five sugar loaves, unfurled and held on a simple staff by a naked child, cherub-like. Following the adoption of the blue-white national flag in 1830, many municipalities adopted local flags that consisted of the new national flag (usually its square variant, which is actually a military colour: bandeira dos regimentos, with the municipal arms on one of the two faces of the flag (usually the reverse), and the unmodified national arms on the other. According to source the flag of this design held in the City Hall may be from 1846-1852 (used by a district governor, i.e. this flag might have somehow stood for the whole island); others with this design might have existed in the prior decade and afterwards. A new change of the national flag in 1910-1911, caused a reflexive modification in all municipal flags of this pattern, and the City Hall of Funchal holds a green-red bicolour flag designed according to this: The arms, otherwise unmodified, show a mural crown. According to source this flag doesn't show the national arms on the other side. It is not possible to ascertain the exact ratio, as only the centre of the flag is shown - conjectural whole cloth image. In 1919 the municipal government had two new flags made: one for hoisting, another for parading, possibly due to deterioration of the previous one(s). It is not known, why a new design was chosen, though the authors Abreu and Gaspar speculate, it may have been politically motivated, due to diminished enthusiasm with the republican regime. These new flags, of which one remains on show, framed, in the City Hall , were white, with the arms panited on the center of both sides, crowned a "nobility" coronet (coroa de nobreza) and, tying the sugarcane and the grapevine (which had evolved from supporters to wreath), a red-green bicolour ribbon, with lettering reading "A NOBRE E LEAL CIDADE DO FUNCHAL". Funchal is the regional capital of Madeira, being with it’s 115 840 inhabitants in 10 communes covering 76 km² by far the island’s largest settlement. This municipality also includes the neighbouring islets of Desertas and the remote Selvagens, 350 km to the south — thus being, if not the largest, the “vastest” Portuguese municipality. These are two clusters of tiny islands near Madeira. None of them has a flag of it’s own: Both are Nature Reserves under the jurisdiction of Madeira’s Natural Park and both belong to the Funchal Municipality. Selvagens are much smaller and, despite the name, much less abrupt than Desertas. They consist of two islands and nearby islets and rocks arranged in two groups lying some 20 km southwest-northeast apart, 200 km south of Madeira, with a total area of only 2,73 km². These islands are in fact nearer to Canary Islands than to Madeira and there have been some recent and discrete moves of the Spanish Navy and Diplomacy to annexate the islands and/or revert its status to that of uninhabitable rock (cp. the Rackall case) so that Spain can have a lot more of its 200 nm Exclusive Economic Zone.